Courtesy of Devil’s Bowl Speedway. 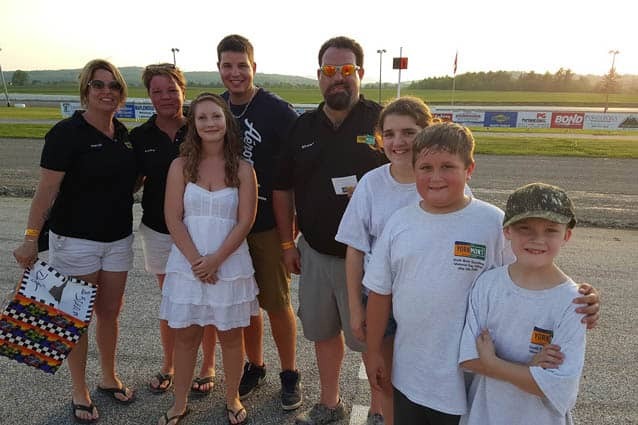 Race fan Emily Catellier of Rutland, Vt. (third from left) won a $5,000 cash prize from Yorkmont Auto Auctions at Devil’s Bowl Speedway. Courtesy of Devil’s Bowl Speedway. Jeff Murray of Georgia, Vt., celebrates his Enduro Series victory at Devil’s Bowl Speedway. WEST HAVEN – Jimmy Ryan may have led every lap of the Sportsman Modified feature race on the Asphalt Track at Devil’s Bowl Speedway on Saturday, May 28, but the box score won’t show just how wild the action was behind him. 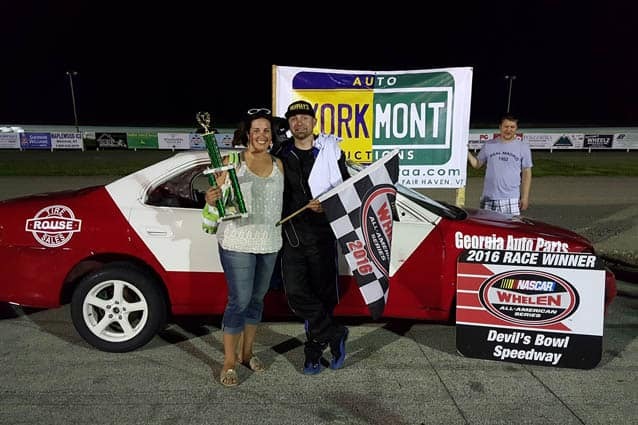 The veteran stock car racer from Shoreham, Vt., outlasted a rough-and-tumble field of competitors to end a six-year winless streak at the inaugural Yorkmont Memorial Day 5000 and headed a winner’s list that included Josh Masterson, Jim McKiernan, Zach Wood, and Jeff Murray. In addition to the on-track action, race fan Emily Catellier of Rutland, Vt., was the happy winner of a $5,000 cash prize. The event was capped off by a holiday fireworks. One week after a fuel line problem left him on the sidelines, Ryan was in the right place all race long, ahead of several multi-car wrecks that shook up the field. Although Ryan said that his car wasn’t handling well, he was able to withstand a sequence of restarts and drive away from the pack every time. No less than eight different drivers tried to rattle Ryan in the early stages of the race before wrecks, spins, or damage hampered their progress. When the smoke cleared after 30 laps, Ryan was the convincing winner for the first time since Aug. 29, 2010, and for the first time in his career under the NASCAR Whelen All-American Series. Jackie Brown Jr., of Hurley, N.Y., withstood a long challenge from Jason Durgan and held on for the runner-up spot. Morrisonville, N.Y., racer Durgan settled for third ahead of Ron Proctor and Joey Roberts. Josh Masterson of Bristol, Vt., was the winner of an entertaining 40-lap race in the Late Model division, for his second victory in as many races in 2016. The Late Models threw off a barnburner, with side-by-side racing leaving tire marks on the doors of almost every car in the class. Masterson drove a strong car to the front of the field after battling with several drivers, then beat hard-charging Robert Bryant Jr., in a restart with just two laps remaining. Brooklyn, Conn., racer Bryant thrilled the fans with back-to-front run, and came out on top of a sensational fight with Bobby Therrien of Hinesburg, Vt., for the runner-up position. The ever-improving Seth Bridge finished fourth with early leader Steve Miller fifth. Jim McKiernan of Moriah Center, N.Y., traded some full-fender barbs with Scott FitzGerald during the 20-lap Renegade race, but came out on top for the second main-event win of his career at Devil’s Bowl. The runner finished ahead of FitzGerald, of West Rutland, Vt., with Colchester, Vt.’s Matt Monaghan third. Ray Germain Jr. finished fourth in his first start in two years, and Tony Salerno was fifth. Rookie Zach Wood continued the perfect start to his Mini Stock career, going two-for-two in his first two starts. After winning on opening night a week ago, the Georgia, Vt., youngster ran to the win. Wood’s teammate and fellow rookie Eric Messier of Hinesburg, Vt., finished second for the second-straight week. Brad Bertrand, Garrett Given, and Andrew FitzGerald completed the top five. Jeff Murray of Georgia, Vt., won one of the most competitive Enduro Series races in recent memory, taking the lead from Rutland, Vt.’s Cory Gray with a dozen laps remaining and fending him off in the final laps. Gray held on for second ahead of Andrew Lopes, Brandon Gray, and Brett Wood. Devil’s Bowl Speedway officials again had to cancel racing at The Dirt Track on Sunday, May 29. Weather forecasters predicted heavy rain and possible lightning in the area during race time, which forced officials to make the call. Poor weather has forced the cancellation of the first two weeks of dirt racing at Devil’s Bowl in 2016. A race date has been added to the schedule for Sunday, June 5 at 6 p.m. for the three weekly NASCAR divisions on the 3/10-mile Dirt Track; a make-up date for SCoNE will be announced soon. All general admission grandstand tickets and pit pass wristbands purchased prior to the previous rainout on May 22 will be honored on June 5. The addition of the Sunday, June 5 date creates a two-track doubleheader weekend at Devil’s Bowl Speedway; the American-Canadian Tour Late Models will be on the half-mile Asphalt Track on Saturday, June 4 at 6 p.m., along with the Sportsman Modified, Renegade, and Mini Stock asphalt divisions. For more information, visit www.DevilsBowlSpeedwayVT.com.